Project33, Long hard night, long hard day. What a day. Overnight on the Spirit of Tasmania, not a great night sleep due to the swell and random music. An extremely early 5.10am wakeup call. Cold, Sun, Dawn, McDonalds, Freeway, Roadkill, History, Village etc. All words to describe the drive down from Devonport to Hobart, approx 270km. We pulled into the small town of Ross, one of the many historic villages dotting the road down from Launceston to Hobart. This one has churches, bakery, a bridge and plenty of beautiful old buildings. If I recall correctly, it was also Tassie’s tidiest town in 2008. Beautiful place and well worth a longer revisit for further exploration. Onwards with todays pic. 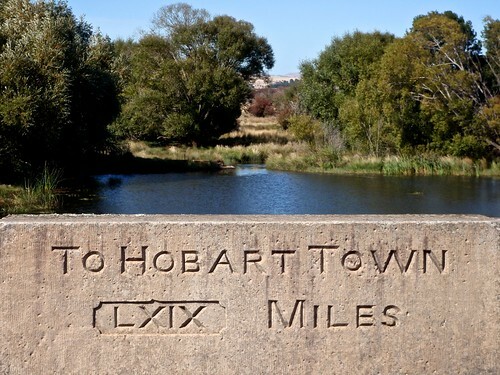 Taken from the midpoint of the historic bridge, LXIX miles (69 if my education was worth its money) to Hobart via the old road. The other side of the bridge had a corresponding distance to Launceston. Still, we made it back to Hobart very tired, but intact. And with the added bonus of a car! Edit : damn that education of mine, updated to the actual 69 miles instead of 119 I had previously mentioned. Thanks Adam for pointing that out. Wow, a very quick flying visit to Melbourne to grab a car. Fly p firsttingin the morning, back to tas via spirit of Tasmania. Fun fun. 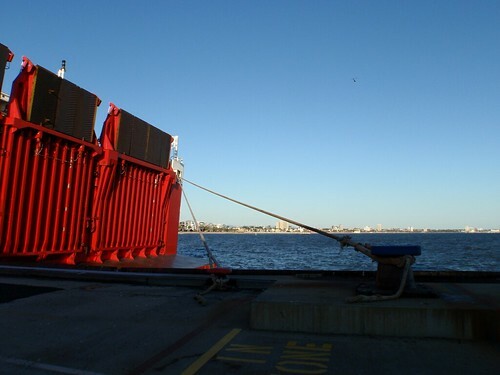 This is the stern, looking back over Melbourne. Written from the back deck leaving Melbourne.